‘Regents Street Ramblas’ which is part of this years London Festival of Architecture – the initiative is being organised by Antonia Faust who works at the Royal Institute of British Architects. This project is a collaboration between Oasis, Hawkins Brown, the artist Bob and Roberta Smith and The Hive Honey Shop. David Bickle, Director of Hawkins Brown has been selected as one of 7 architects to work with retailers on Londons Regent Street. They have been selected by Oasis the women’s wear brand (located just north of Oxford Circus towards the BBC) to decorate their shop front window. David approached The Hive Honey Shop after hearing about our extensive collection of modern and antique beehives from around the world. The Hive Honey Shop were delighted to help and donated various beehives including beekeeping consultations. In return Hawkins Brown have kindly donated their perspex beehive, made specially for this event, to The Hive Honey Shop. It will be on display in our shop window from Tuesday July 7th for all to see. 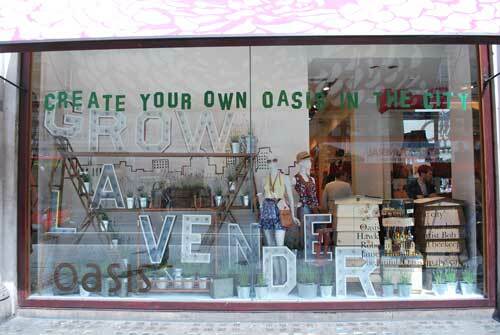 The Hawkins Brown window is available for all to see at any time – a kind of 24/7 gallery. It will be dismantled on Sunday 4 July. So hurry and pop down to Regent Street to have a look while you still can. It is a well thought out theme and a tribute to bees and beekeeping in London. Special thanks to Hawkins Brown and Jay Lowdon, Creative Consultant, window photo.